As is true of anyone who is long on love and short on cash, Isaac likes to find things around the house, wrap them up in scrap paper, and give them to people. Tonight at dinner he gave me a present wrapped in old construction paper and about a half-mile of tape. 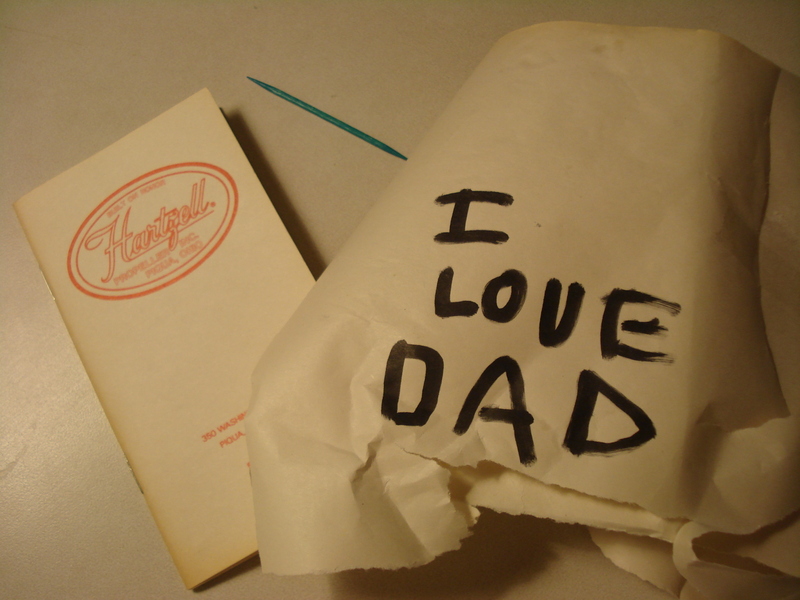 The words “I LOVE DAD” were penned in thick black marker on the front. To the back of the package he had taped a blue toothpick. Why, the mind of a six year-old replies, in the world not? Blue toothpicks are awesome. Inside was a faded, pocket-sized memo pad stamped with the emblem of the Hartzell Propeller Company, in Piqua, Ohio. How did it come to be in the little basket of scrap paper at the boys’ art table? Who knows. How did it come to be wrapped in scrap paper and far too much transparent tape, and placed in my weary hands? The fierce-hearted love of a boy, is how. Reading this reminded me of a birthday card my middle son made for my wife when he was three. It consisted of a green piece of paper with a drinking straw taped to it and some scribbles. It is still hanging on our wall in our bedroom, years later. No other birthday card has had such endurance. What a fine word, “fierce” is to describe the heart of a boy. Thank you for sharing, Tony. I teared up reading this. I’ve gotten so many of these gifts over the years. Sometimes I find them on my pillow when I get ready for bed long after all the kids are asleep. They remind me that no matter how the day went, or how surly I was when I got home, I am loved. There can be no greater joy. Thanks for sharing. Tony, what a wonderful post today. My 3 daughters are adults and having their own children now……..oh, what incredible gifts I have received from them, gifts just as you received, and gifts that still reside in my home and in my heart. Thank you for the opportunity to remember all the presents my children have given me. Fierce is the perfect image. I want to do fierce. What a touching, beautiful gift. And who *doesn’t* think blue toothpicks are awesome? And does anyone believe fierce love normally comes about, except with Mama’s encouragement? Yay, Mama!! And (of course) yay, Daddy and child!! How very sweet! only a man with a fierce heart can appreciate the love and depth of the gift like this. it seems red pipecleaners are akin to blue toothpicks, just in case you wondered.